Vinyl; Pro-Ject RM-5SE with Audio Tecnica AT440-MLa cartridge; Speedbox power supply; Creek Audio OBH-15; Audioquest King Cobra cables; M-Audio Audiophile 192 Soundcard ; Adobe Audition at 32-bit float 96khz; clicks and pops removed with Click Repair, manually auditioned, and individually with Adobe Audition 3.0; resampled using iZotope RX 2 Advanced SRC and dithered with MBIT+ for 16-bit. Converted to FLAC in either Trader’s Little Helper or dBPoweramp. Tags done with Foobar 2000 and Tag and Rename. My memory of the first time I heard Shirley Collins sing is really more about a feeling than a circumstance. It was the same feeling I had hearing John Fahey or Townes Van Zandt for the first time, of being hushed into silence in the presence of an individual who could, with the bare minimum of adornment, channel an entire tradition. They are ventriloquists for those people and places that are among both the loneliest and the most human of our species’ musical heritage. Though situated in vastly different contexts, for me all three epitomize a kind of archetypal troubadour where the song itself is always paramount. The identify of the performer-as-interlocutor is effaced, sometimes completely, in the service of the message that is the song. This may be the crucial difference between what constitutes “folk” music as I understand it and the stuff that comfortably fits in the “singer-songwriter” genre that, at one time at least, was often conflated with it. The singer-songwriter needs the audience to identify with them as individuals with personal trials and tribulations. Even though Fahey and Townes composed gobs of original music, there isn’t as much a sense of a ‘persona’ at the wheel as there is of an oracle giving voice to all these stories that had already existed before they came along and uncovered them. Like some sort of archaeologist sculptors chipping away at the bedrock of barren riverbeds, their artistry was often in knowing what to strip away in order to leave behind the spare essentials of a single idea, more like curators than performers, cataloging some invisible city in painstaking detail. 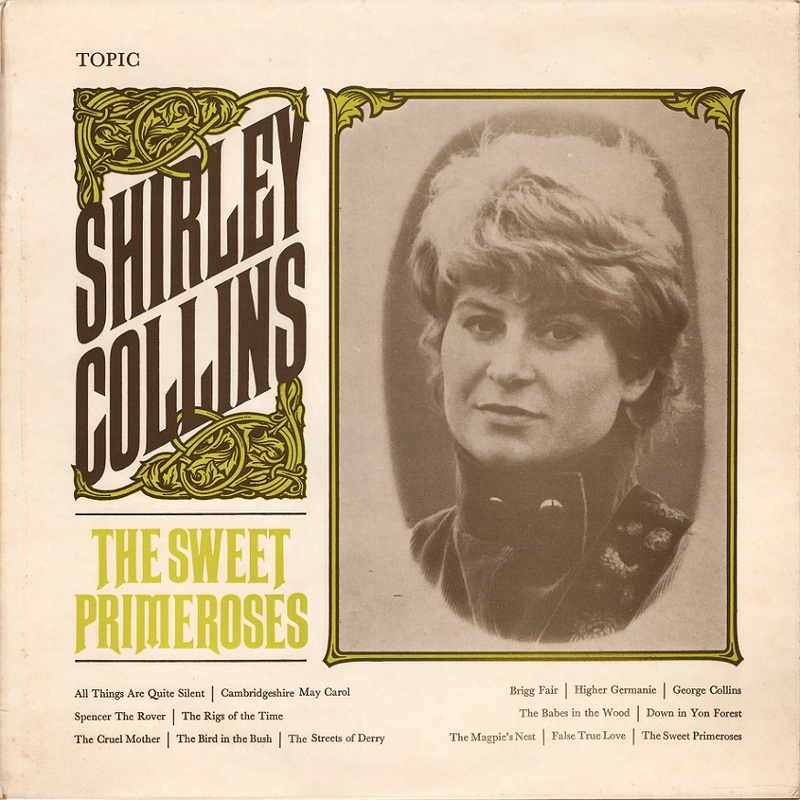 And Shirley Collins was and continues to be the curator par excellence, a literal song collector who searched for the uncelebrated treasures of Britain, and even scoured the hills of North America with Alan Lomax compiling material that spreads across continents like tributaries of some great river of inspiration. She is a sculptor too, but also a cartographer, mapping out the connections between musical moments and the people who inhabit them, leaving a well-marked trail so we can follow her into the spiritual labyrinthine hearts of places often lost to memory. This track might have been a late addition to the LP, because it was not listed on either the jacket or the center label of the 1967 release. Because of that, I don’t have the benefit of referring to Shirley’s own words about the piece (although she has probably written about it elsewhere, at the late hour in which I am finishing this post I’m afraid I will not be searching for it). The tale it tells of a tragic hunting accident seems to combine so many perennial themes in her music – the foolish violence of men, and the unrequited fealty of the women bound to them, framed by ghostly transformations in the moonlit snow. In it’s somewhat mysterious appearance on the grooves of this LP, it seems somehow fitting that its final lyric lent the title to the best introduction to Collins work that I know of, the CD compiled by admirer David Tibet entitled Fountain Of Snow. 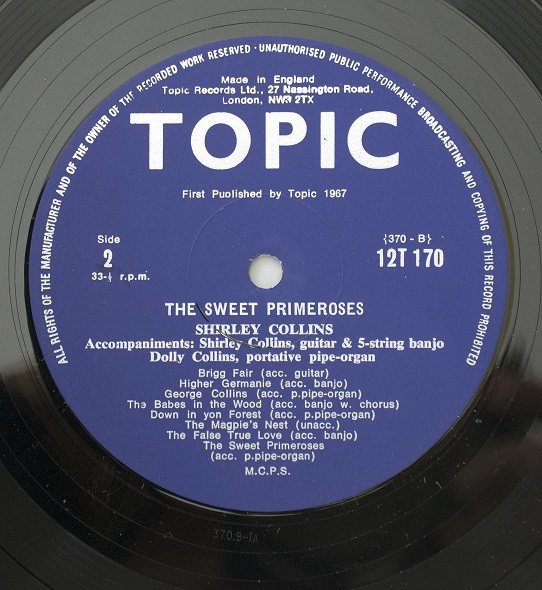 In her illuminating notes for the rest of the songs on The Sweet Primeroses, we see that Collins approaches her material with the eye of a scholar. Yet I don’t hear in her music the kind of didactic quality that I find off-putting in many of her contemporaries of the early folk revival. Perhaps that goes towards explaining why this music has endured so well, why it attracts such a diverse group of listeners (oddballs like Tibet, or myself for that matter), and why it is difficult to pin down to any particular time period. Accompanied here only by her sister Dolly on the “portative pipe organ,” with vocal trio The Young Tradition chiming in on a few numbers (they were uncredited at the time, perhaps due to being contracted to a competing label, Transatlantic Records), she certainly doesn’t seem particularly concerned with the fashions of 1967. And yet she wasn’t a staunch traditionalist either. As the album jacket points out, Dolly’s instrument here, based on something dating back to the twelfth century that was played with a bellows a bit like a harmonium, was modified to work with electricity and free up both hands. Furthermore it was only paired with this repertoire of songs because she was apparently dissatisfied with attempts to accompany Shirley on the piano. This striving for the most effective way to present her collections of traditional material is something of a theme that might be easy to miss in Collins’ work, and it runs through even her earliest records from nearly a decade before this one. 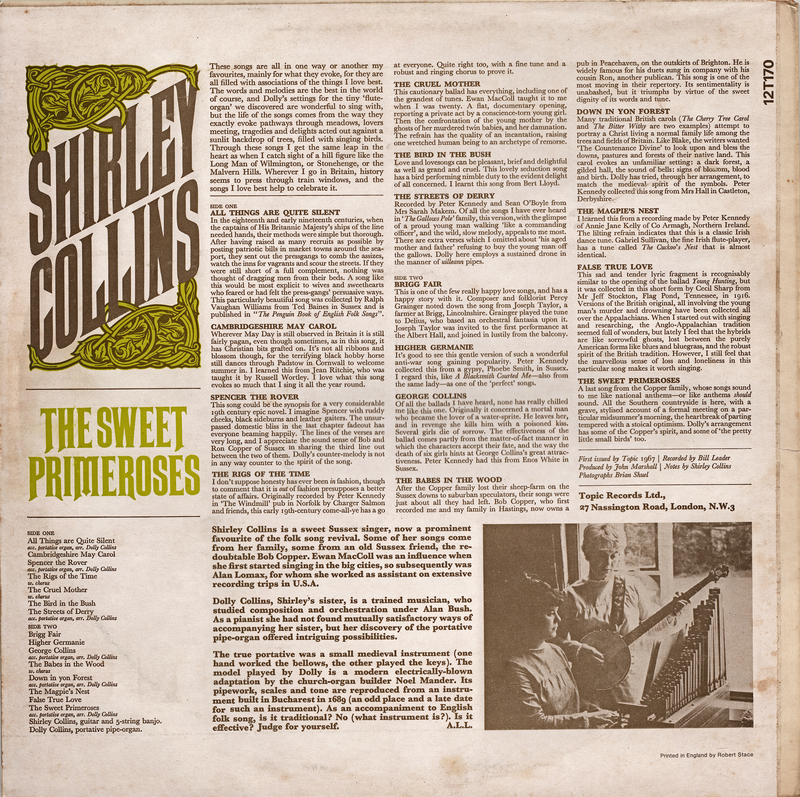 The folk revival of Shirley’s generation had different moorings – in fact, the label Topic Records which released this album was the commercial arm of the revolutionary Workers Music Association founded in the late 1930s. But like Sharpe she also traveled across the Atlantic seeking to reconstruct something of her own history. The preservation of traditions is also always a reinvention of them, involving a complex series of choices of what to select and what to exclude, linked to a deep-seated and thoroughly modern need to experience sincerity in our lives, to connect our sense of self with something larger, something with roots. I would like to know the precise contours of the journeys of self-discovery that led this daughter of a landscape gardener from southern England to throw in her lot with a (formerly Harvard-bound) son of one of the top musicologists of the US who was twice her age named Alan Lomax. But for that I suppose I will have to either ask her about it directly, or get my hands on a pricey copy of her memoir “America Over The Water.” There are other questions I would ask her, like about her encounter with that hypothetical “mountaineer with his banjo.” Because a few generations before Lomax and Collins traversed the dusty roads of the countryside, the banjo was considered by their ballad collector forebears as an insidious intrusion of modernity, something brought to these remote locations by the railroads (along with the six-string guitar). The instrument those earlier song collectors favored was the dulcimer, and in fact they propagated a revival of the dulcimer’s use and even its craftsmanship through the “settlement schools” of the progressive reform movement that spread through Appalachia. 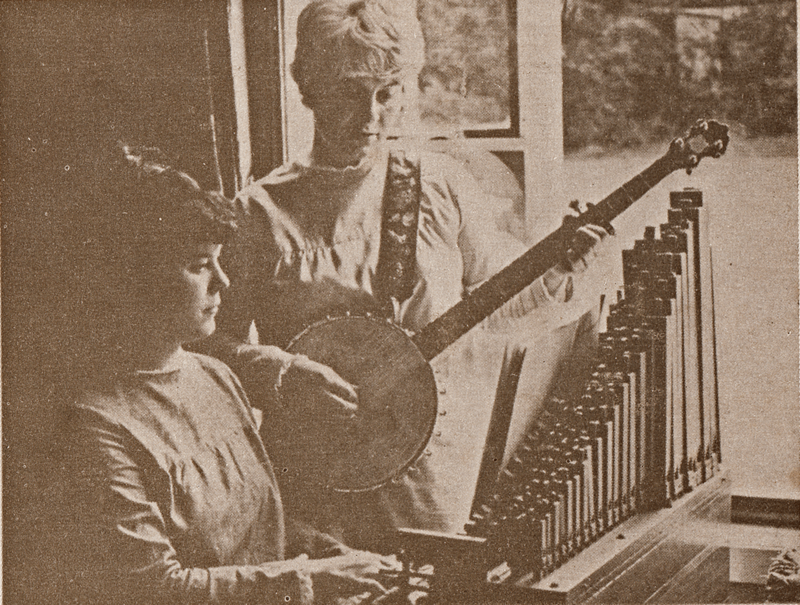 One of the main figures associated with the revival of the dulcimer, Kentucky native Jean Ritchie, was an influence on both Lomax and Collins, and taught her one of the songs that appears on this album (Cambridgeshire May Carol) as well as material that appears on the Folkways album. Lomax actually met Ritchie in New York at a settlement school in the Lower East Side where she taught music. She later won a Fulbright to trace the connections between Appalachian ballads and songs from the British Isles, which I suspect is how she eventually met Collins (although I’m not sure). Shirley played the dulcimer on a song titled “Locks and Bolts” recorded for a four-song EP on Topic in 1963, but it was not an instrument she pursued (in its “pure” form anyway, c.f. “the instrument”, her custom made dulcimer hybrid..). That song was included on the CD reissue of this album in the 1990s. A few years after The Sweet Primeroses, Shirley and Dolly would record the ambitious Anthems In Eden project, a record which would have a huge impact on the admittedly small pool of people who were tuned into such things. In it, restless Dolly put together much more ornate arrangements utilizing a handful of musicians trained in “historically informed performance” and “early music,” utilizing little-known and seldom-played instruments like the crumhorn, the sackbut, and the rabec to flesh out the sound for a suite of songs about… the First World War. The result of this temporal mash-up is a bit baroque in its ornamentation, and required a few listens on my part to acclimate myself, having discovered her work through the stoic approach heard on this album and its successor, Power Of The True Love Knot. I can see now how it was actually a bold experiment, and it apparently reduced one Ashley Hutchings to tears. Hutchings was a bassist recently departed from his group Fairport Convention, and about to form Steeleye Span before abandoning that project as well. Anthems In Eden impressed him enough that he pursued Collins, convinced her to marry him, and soon talked her into singing for the Albion Dance Band, which against all odds managed to combine her high and lonesome bearing with the dynamic shifts of an electrified folk-rock ensemble to stunning effect. She sang on a couple records with the Albion Dance Band with Hutchings, as well a project called Morris On, both featuring an amalgam of heavy-hitters in the early 70s British folk-rock scene. Apparently Hutchings had a habit of perpetually walking away from things he’d started, because he abandoned Shirley as well. She made one final album with her sister Dolly in 1978, returning to the sparse austerity that first grabbed my attention, before losing her singing voice to dysphonia and walking away from recorded music entirely until 2016 (more about that in a moment). Since I spoke one word to thee. Then your heart is no longer mine. That the sun rose up in the west. Nor have courted no other one. Last Tuesday I got an email that her new LP, Lodestar, had shipped out to me. In fact it is possible I might even have it in my hands tomorrow. I’m so glad that she decided to record again, and hoping illogically that the fates will somehow see to it that I’m able to catch one the handful of performances slated in the coming months. In the couple of clips that I have heard from the album, there is something of the careworn directness of Elizabeth Cotton in her approach, something that I think was always there even when she was many decades younger, but is perhaps now more obvious after taken a “break” of thirty-odd years from performing. So maybe I shouldn’t be surprised, when digging up Lomax’s commentary on a recording she made in her early twenties, to see him speculating (or in today’s parlance, it’s really more like mansplaining) that given enough time and life experience, somewhere around the half-century mark Shirley would be able to sing with the same command of style as “an Aunt Molly Jackson, or an Elizabeth Collins.” Well you can imagine what I think of that remark, and anyway it is obvious Shirley didn’t have to wait nearly that long, as she was plainly in her element in this 1967 recording. I hope you enjoy it as much as I do. Tagged English Folk, Shirley Collins. Thank you. A wonderful singer with a voice like no other I know of. Thank you! Her voice always seems to be swathed in cotten. I agree that it’s wonderful and like no other. I always kept Anthems Of Eden as a precious jewel in my LP collection. It was only years later that I discovered the rest of Shirley Collins works. So touching and wonderful we are lucky that there are these recordings to remind us how great she was in her heyday!